Our 4th Worship Music Open Mic! The first one was very worshipful! A lot of people showed up and played. The 2nd one was very intimate and full of love. We added an hour and it is now 6-9 PM. The 3rd one had tears of praise and spirits were moved – we even had a youngster or 2 get up and praise in music! Some have played original compositions they have written honoring our Lord. Some have played popular worship songs. We have had a set with harp that left people stunned, a violin player that was amazing, popular Jewish worship music and popular Christian worship music – It is AWESOME! We are the “GREEN” Door in the middle! 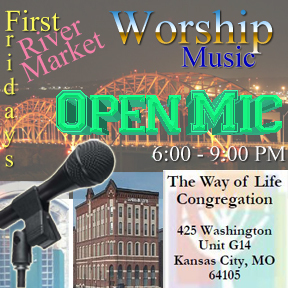 This entry was posted in Derekh HaChaim (The Way of Life) and tagged 425 Washington, 425 Washington Kansas City, downtown, First Fridays, Kansas City, MO 64105, music, OPEN MIC, River Market, The Way of Life, Worship. Bookmark the permalink.